The crowd was quiet, panicking. The Ohio offensive feast in the first half turned to famine in the second and Northern Illinois had recovered from a 18-point deficit to reclaim the lead. Then Jaaron Simmons took over. 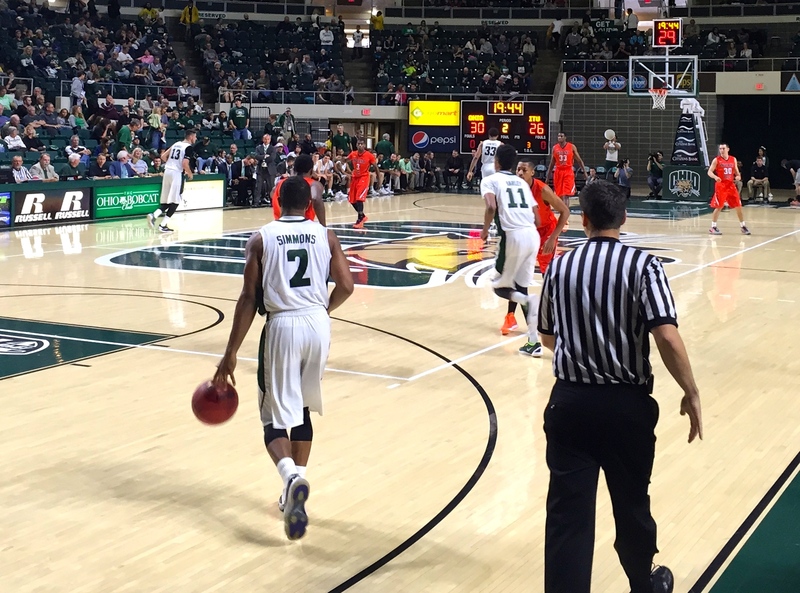 With his team down one and four minutes remaining, Simmons shouldered the load, scoring or assisting on all but one of Ohio’s final 16 points, and led the Bobcats to a 80-69 home victory over the Huskies. Simmons recorded a double-double of 24 points and 12 assists, his fourth of the season. Ohio (14-8, 5-5 Mid-American) led 49-33 at halftime after shooting 61 percent from the floor. NIU was shooting 36 percent at the break. The Huskies responded by opening the second half on a 21-4 run. Phillips says Ohio’s streaky play is a byproduct of the system it runs. Freshman guard Jordan Dartis had 17 points, 14 of which came in the first half. Treg Setty tallied 12 points and five rebounds. Tony Campbell added 11 points and seven boards. Aaric Armstead led the Huskies (16-7, 5-5 MAC) with 15 points and 10 rebounds. Marin Maric had a double-double of his own with 11 points and 10 rebounds. Levi Bradley added 15 points in the loss. The Convocation Center was far from filled, but the Sibs’ Weekend crowd of 8,773 was great according to Phillips. The win concludes Ohio’s homestand. The Green & White will travel to Muncie, Indiana on Tuesday to take on Ball State (15-8, 6-4 MAC). The Cardinals share the top spot in the MAC West with Central Michigan.